Lives used to be scattered like throws of a dice on the market floor at Souk Al Ahad. You had to search for them, but they were there, hidden beneath pink plastic pianos and mountains of miscellaneous clothing. If you had the patience you could find almost anything. At the far end, almost by the main concrete pillars that propped up a motorway flyover, you could turn left into a canopied area running parallel with the road overhead. It had clearly defined thoroughfares and, at its furthest reaches, an enclave of book sellers and antique dealers, some of whom sold plastic bags filled with the remnants of someone’s past. The photographs within those bags were often intimate, with messages scribbled in fading ink and the barely discernible traces of a person’s fingerprint. There were names, too, and dates. The 25th of April 1952. The 28th of March. Even a school identity card for the year 1949 to 1950 and the name Reem Inam Asad Abi Musleh. It was quieter in that enclave. Away from the loud-speakers and the disorientating tapestry of proletarian endeavour. Away too from the the sweet seller who piped swirls of saccharine dough into a bubbling vat of oil and the juice vendor who squashed oranges in a hand-operated citrus press. Of the photographs I loved, one in particular stood out. It was of a wedding in Zahlé. There was something magical about it: the young girl with a chain of white flowers in her hair; the emotionless groom; the sea of rustic faces darkened by the Levantine sun. There were others too, although it is impossible to discern where many may have been taken. 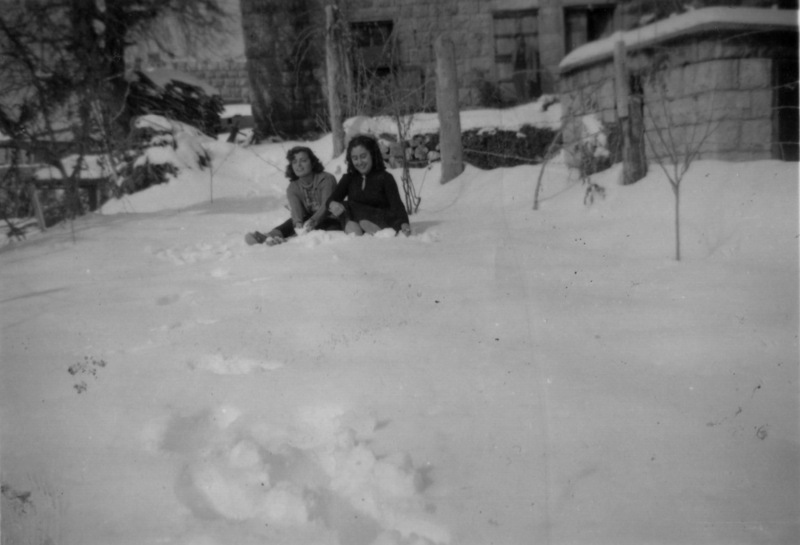 Some have Ain Ksour or Aley written on the back and one, possibly taken in Ain Ksour, is of two young women smiling as they play in the snow. “The bride reminds me of an aunt,” says Areej Mahmoud, an attractive young man with thoughtful eyes. “The clothes of the groom remind me of the clothes that my father wears in old photos that I know. The crowd looks like a large family, like mine. Some people in the crowd have hard faces, perhaps from Mount Lebanon (a place that I know very well). It is late afternoon in Beirut and Areej and I are discussing the peculiarities of Lebanese nostalgia. That golden glow that surrounds the past and sidelines the present. That ‘distant familiarity’ and sense of distorted collective memory. At the heart of this nostalgia is imagery: of the ordinary, of the mundane, of towns and cities before the war, of simplicity and cultural icons. You can see it in the work of Yazan Halwani and Alfred Tarazi. Even in the bags of designer Sarah Beydoun. She is sitting on a balcony overlooking the sea. Inside are suitcases from Damascus and unmade sheets. She has tight red curls and deep, luminous eyes. She once told me that Beirut was a city of ghosts, haunted by splintered souls and broken brown-eyed men. She has that love/hate relationship with the city and wider Lebanon that most of those who have lived there do. As an outsider I never saw it that way. I took it for what it was: an ugly and pockmarked city scarred by war and butchered by the greed of a political and commercial elite. It epitomised the failures of government and the horrors of unregulated urban growth. But slowly it became a city of music and sensuality. It became the sea at dusk and uncontrollable laughter. It became the intimacy of a derelict bed and the sensation of a lover’s body. Now it is almost impossible for me to separate Beirut from the woman I love. A few days later we speak. “Did you know there are more Lebanese in Brazil than there are in Lebanon?” she asks. “I just spent six months there. It’s crazy. There’s such a Lebanese presence there that it’s like there’s a whole other country. They have the traditions, they eat tabbouleh, they eat hummus, they have Sunday lunches in clubs where a woman sings in Arabic and they all sing Fairuz together. 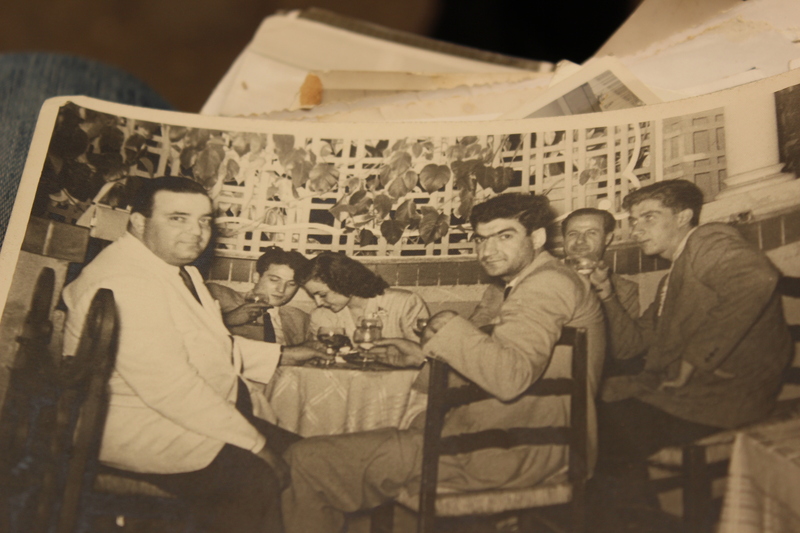 Ayla is in the early stages of organising an exhibition exploring the element of time in Beirut. How things linger and linger and linger. “You have destroyed cars on the side of the road for five years. Unfinished buildings. I want people to reflect on our current state,” she says. She asks questions, both of me and of her work. How much of her life does she owe to Beirut? What is this idea of home? Is it unnatural to be away from the habitat she was born and raised in? Shouldn’t the vision of an imaginary or romanticised past be put to rest? Why do we hold on to it? How do you catch that train? “This is a question we ask ourselves all the time. How do we heal this place? How do we fix it? How do we fix a broken place? Unless we change the system there’s nothing we can really do. I don’t know. I need to accept it as it is I guess. That’s one of the things that I need to do personally, because that’s why I always want to leave. I keep thinking it’s better than it actually is, you know. I was once asked to walk along the Corniche at night and count how many apartments are lit in the new buildings that clutter Beirut’s skyline. I didn’t, but I instinctively knew the answer. Within every new 10 or 11-storey building, only two or three apartments are occupied throughout the year. To make way for each of these monuments to corporate and political greed, two or three-storey buildings housing 10 or 12 families had been destroyed, their inhabitants uprooted and carted off to religiously segregated suburbs. 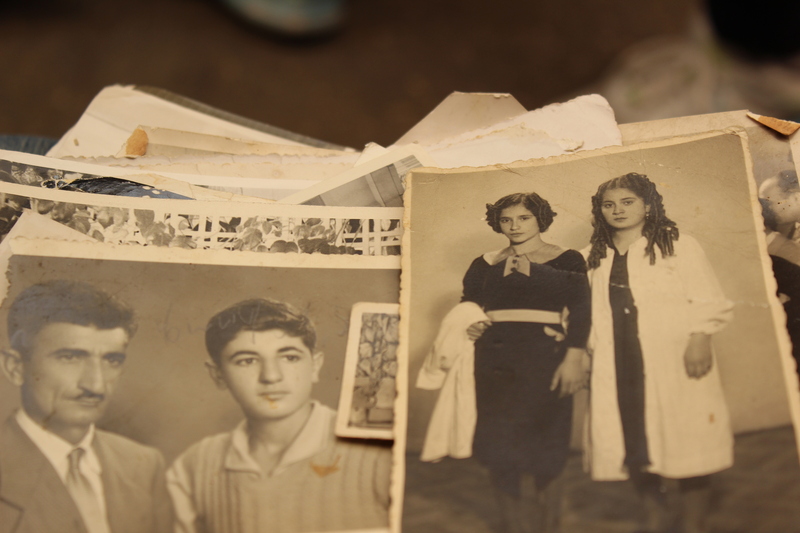 Any attraction to Lebanon’s past is directly related to the frustrations with its present. No electricity, no water, no security, no president. This is Lebanon today. “Nostalgia is not the answer. Reminiscing about the past of Lebanon has always made me furious,” insists Areej. “Romanticism and nostalgia are nauseating concepts for me. And so I have always taken pleasure in picking fights with people who call Lebanon the ‘Paris of the Middle East’ or a ‘piece of heaven on Earth’. I have also always enjoyed ridiculing theories about the origin of Lebanon. Such theories are often partial and have always caused conflict. I have as much love for Lebanon as I have hate for the ridiculous delusional mythologies about its past. Romantic Lebanese writers like Ameen Rihani gave me bellyaches during Arabic literature class at school. This is a glimpse of my relationship with Lebanon’s past. “But the history of Lebanon is a fascinating subject. Understanding where we come from and how and why we got here is essential for our progress. A scientific and objective approach is absolutely necessary to evaluate the history of Lebanon and its people, and creating consensus around a unifying story is absolutely necessary to replace the tribal and sectarian romantic and nostalgic nonsense that divides the Lebanese. A few days later on a rooftop terrace in Mar Mikhael, a sense of peace and serenity has descended. A party plays out below and all around is dark, the blackness of night punctuated only by circles of golden light radiating from the occasional streetlamp. Beirut is beautiful at night. Like Cinderella. Sparkly and glittery in the darkness, tattered and down-at-heel in the light. A friend once said that Beirut is as poetic as it is tragic. She always wanted to run after it, to fix the seams of its dress and to straighten its crooked bow tie. Lebanon exists as much in the imagination as it does in reality. Even I have memories that are not mine. One is of a young girl, perhaps four years old, eyes etched with fear and uncertainty, fleeing the civil war by boat in 1982. I cherish this memory, even if it does not belong to me. Well worth reading, this is special!